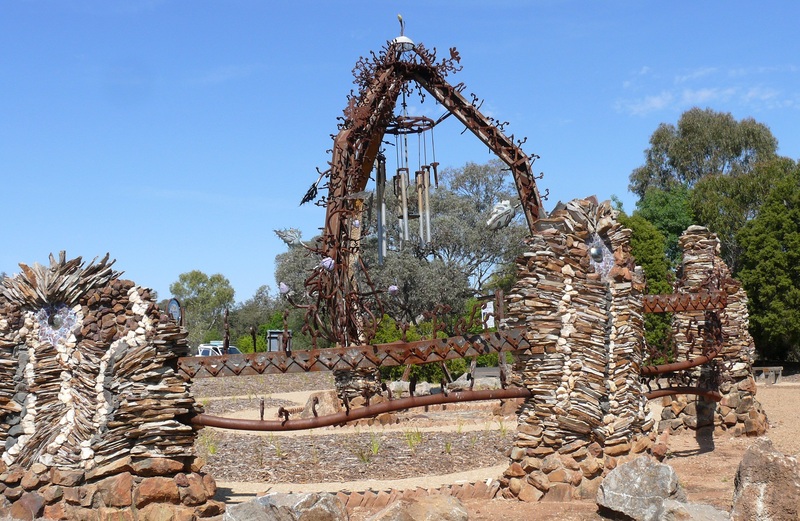 Gilgandra | Frank & Donnis Travel Blog "the more we see the more there is to see"
Apart from spending a good part of my day at the Western Plains Zoo I re-visited the freedom camp site at Terramungamine with the intention of finding the aboriginal rock grooves. As it turns out they were reasonably easy to find but badly signposted. Not one sign anywhere along the highway, the turnoff to the campsite or the campsite itself. In the end I just walked along a track beside the river and found a sign at the site. 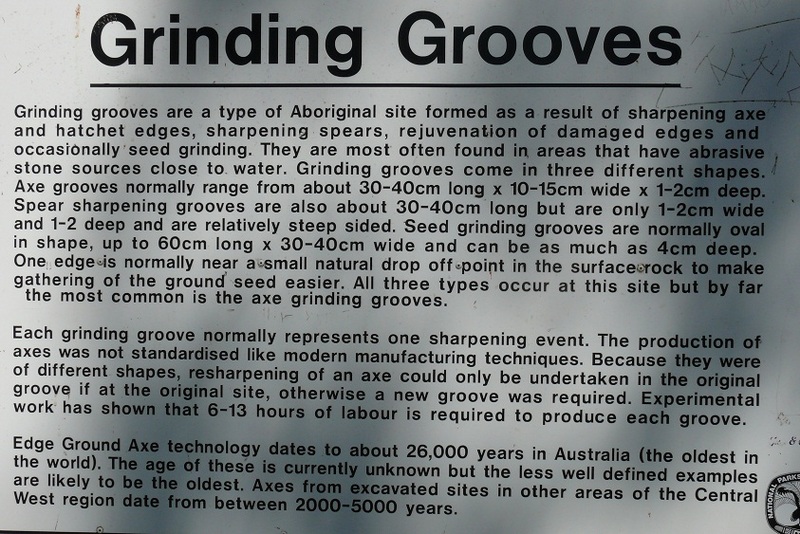 The one and only sign at the site of the Aboriginal weapon and tool making groove site. I drove all this way and searched for the site to find The Grooves. Perhaps the National Parks people are trying to keep visitor numbers down and quite frankly once at the site there is very little to see. On the return trip to Dubbo I saw a set of satellite dishes on a hilltop. Although it looks impressive it seems it belongs to a little known rural telecommunications company. In the morning I drove in TERIOS to Wellington about 50 Klm from Dubbo. Wellington is another Heritage listed town but regrettably I was running out of time to explore. 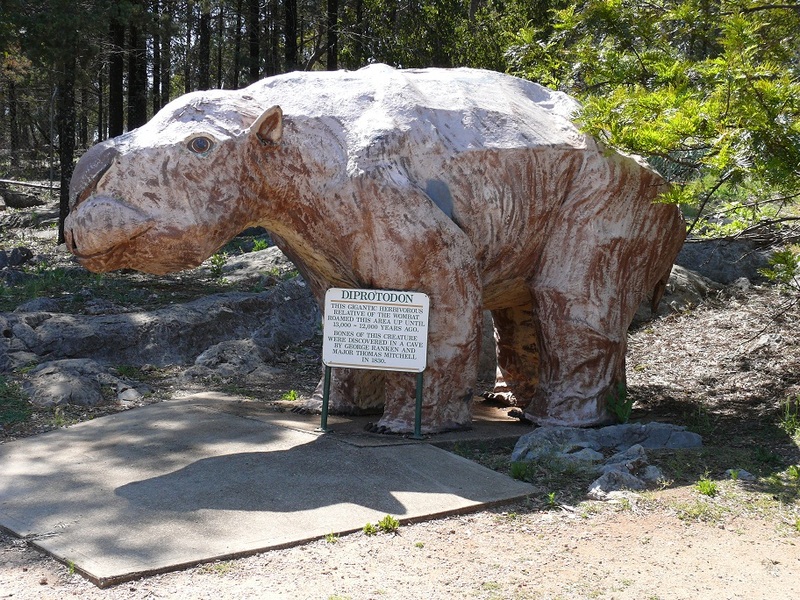 Interesting but weird sculpture at the entrance to the Wellington Caves road. Closeup of a part of the sculpture. 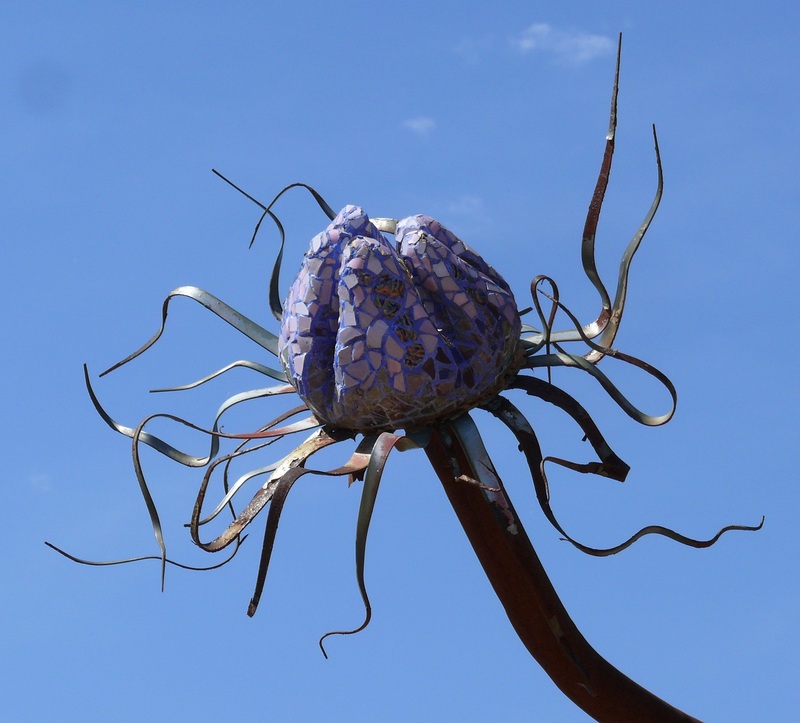 It reminds me of a creature from the movie, Day of the Triffids. Interesting but not weird tree also at the entrance to Wellington Caves road. The mission today was to visit Wellington Caves. 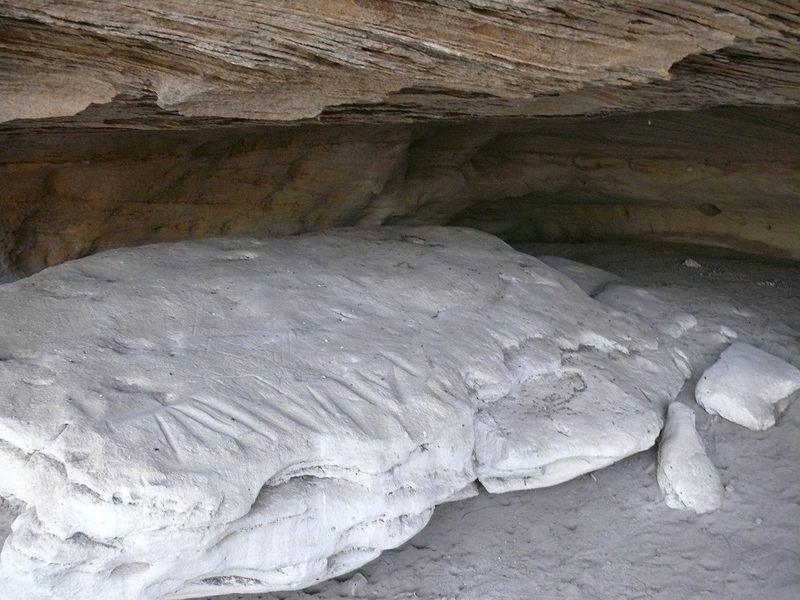 Fibreglass Diprodoton, the skeleton of which was found in Wellington Caves. 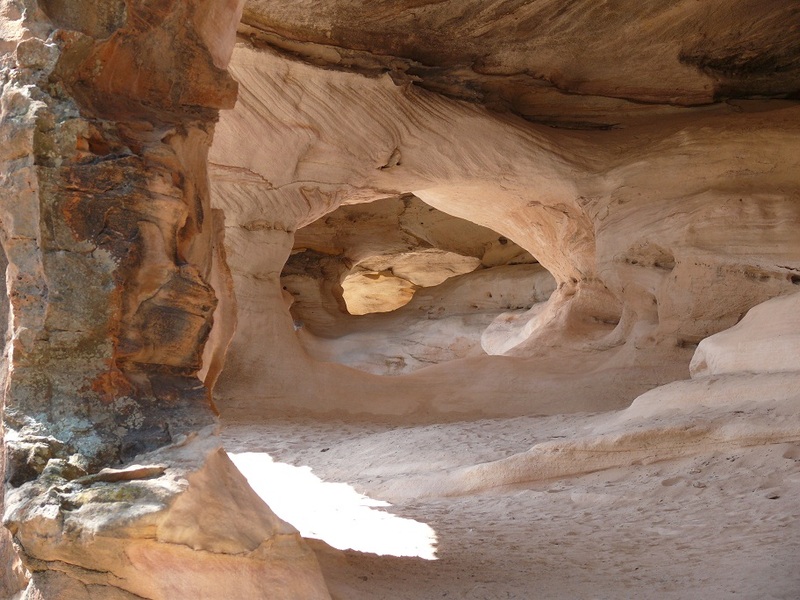 These are unusual caves in that they are privately owned and operated and at one stage a phosphate mine was undertaken. 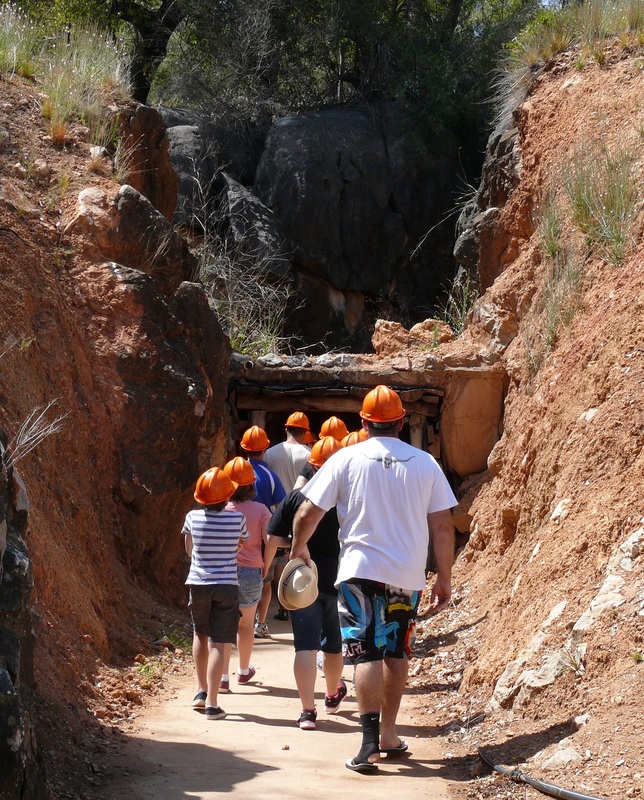 Entrance to the phosphate mine below the original opening to a limestone cave above. 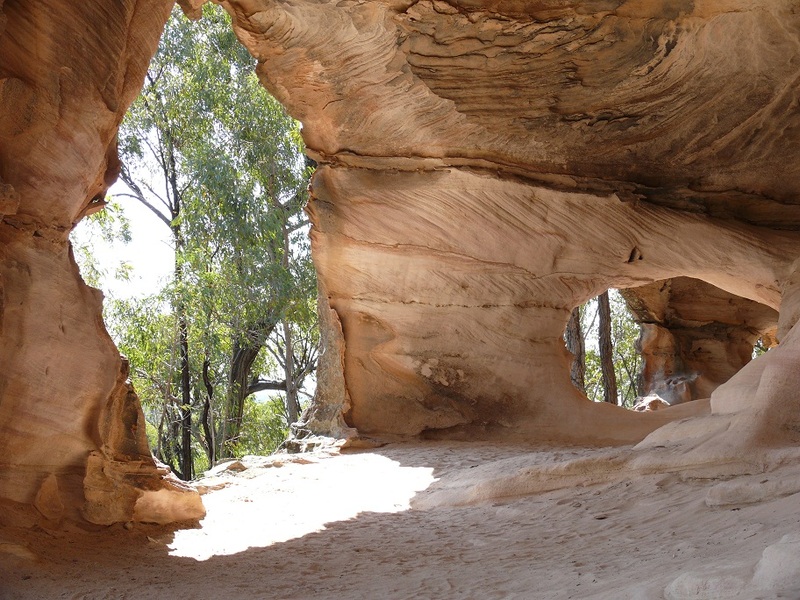 The caves and mine contain many bones including that of a Diprotodon a huge car sized ancient relative of the Wombat. I only had time to visit the mine tour from which I learned that the phosphate (bat guano from a million years ago) was intermixed with limestone and as a result was somewhat low grade. The guide had no idea why there were such extensive tunnels in the hillside if such low grade product was virtually useless. What were the miners doing underground 100 years ago? The mine and caves were closed for 80 years and only re-opened to the public this century. 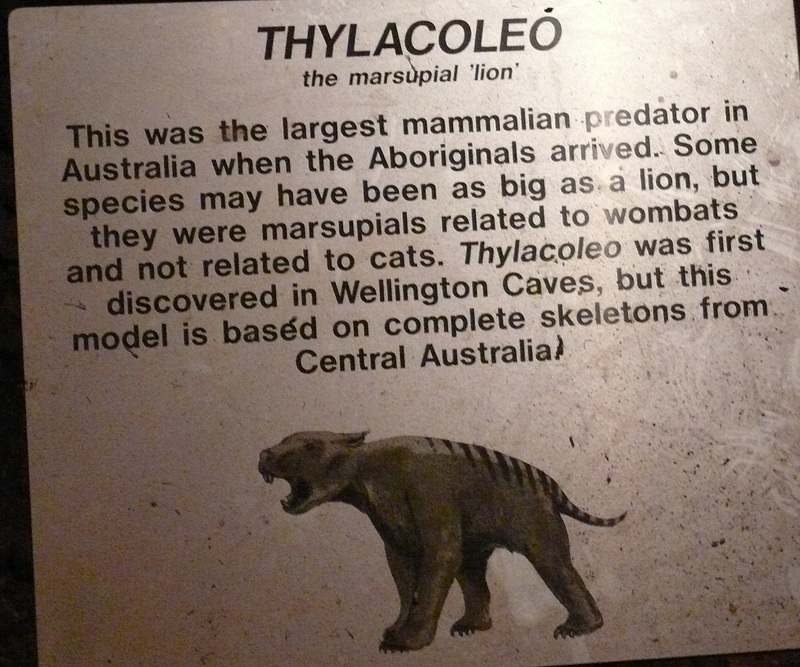 The skeleton of another animal, Thylacoleo, a Marsupial Lion were found in this mine. 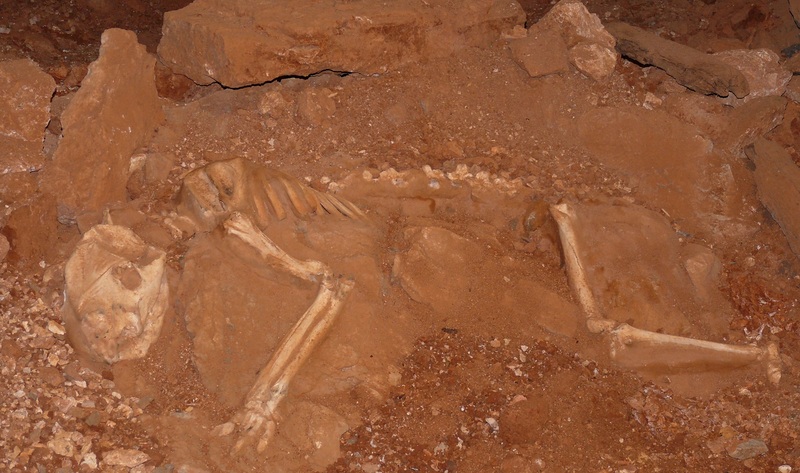 Plaster model skeleton of the Marsupial Lion found in the mine. On the way back to Dubbo I diverted onto a gravel road to Ponto Falls expecting to see umm err a waterfall or two. I arrived at a section of the Macquarie River where the river widened and rushed across a shallow section canoeists call a “gravel race”. It was by any standards a low grade gravel race. I was disappointed there was no waterfall. Tonight while washing up in the camp kitchen I was approached by a strange man wearing a fishing jacket. Instead of fish hooks, lures, sinkers and other fishy stuff this man had several mobile phones (one for Australia, one for incoming Indonesian calls, one for outgoing Indonesian calls, another phone for Malaysia and so on), his glasses, pens, scissors, notepads, bulldog clips and all connected to his jacket with neck straps. He claimed to be a Christian healer and travels overseas curing people from such things as cancer, broken bones, sleeplessness, hatred or anything else he could think about on the spur of the moment. The other people in the kitchen beat a hasty retreat leaving me with my arms in suds at the mercy of the healer. Dubbo and Wellington have lots of interesting natural and other attractions just waiting for me to explore. Regrettably I am moving further north so I will have to explore another time. While it is fresh in my mind I want to give a pat on the back to the Dubbo City Holiday Park. Yes it has some items which need attention but overall the experience was good. As I do not usually stay in van parks I should mention this is the first park, ever, which provides a full level concrete pad. Not just a half pad to use as a flat space for an awning or annexe but a full pad to park on and still have awning/annexe space. Each space is separated by small trees or shrubs. Not totally private but enough to delineate space and provide some shade. They also provide a good clean well equipped camp kitchen which has and enclosed section for inclement weather and an outdoor section for good weather. There is a Sunday night happy hour with a sausage sizzle and a musician. They also have a car/caravan washing facility beside a dump point. They are also the cheapest in town. I arrived in Gilgandra for coffee and after weighing up the attractions to visit I decided to travel another 90 klms to Coonabarabran and a further 35 klms to Warrumbungle National Park. WWWGO in camp at Warrumbungle NP. 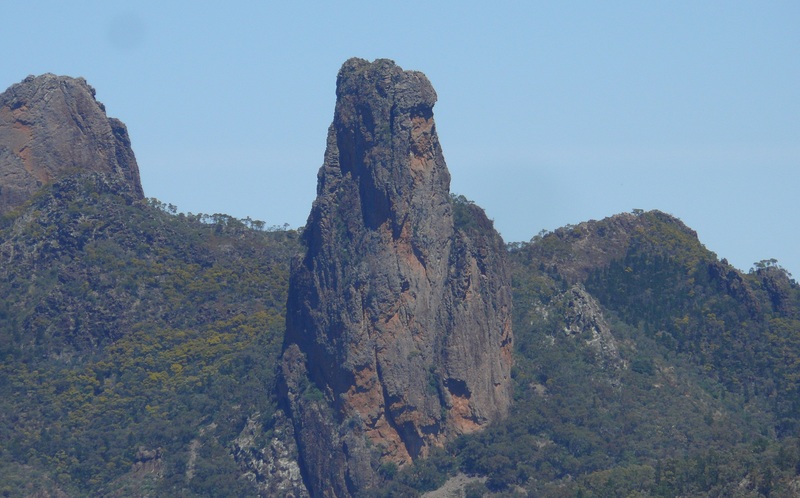 The Warrumbungles is an area of former volcanic activity and is well known for fossil finds. Interestingly the drive from Coonabarabran through a delightful valley showed many small backyard telescopes. These scopes are owned by amateur star gazers, dedicated scientists who sometimes work from home and individuals who offer public access…for a price. I booked into a powered site inside the park and settled in for the night. The trip from Gilly to Coona showed a marked change in the countryside. From flat plains to long gently rolling hills to increasing ranges and finally out to The Warrumbungles and the short steep hills and mountain ranges had WWWGO back to 2nd gear at times. This morning I set out with the best of intentions to walk around Split Rock, a massive monolith visible from many places throughout the park. I wore I long sleeved shirt and carried lots of water and a broad brimmed hat. Within 30 minutes the 34° heat and loose rocky, steep pathway slowed me considerably. Either I was dehydrated or my hypertension was kicking in but I felt unwell and discretion is the better part of valour so I slowly walked back to the car-park. 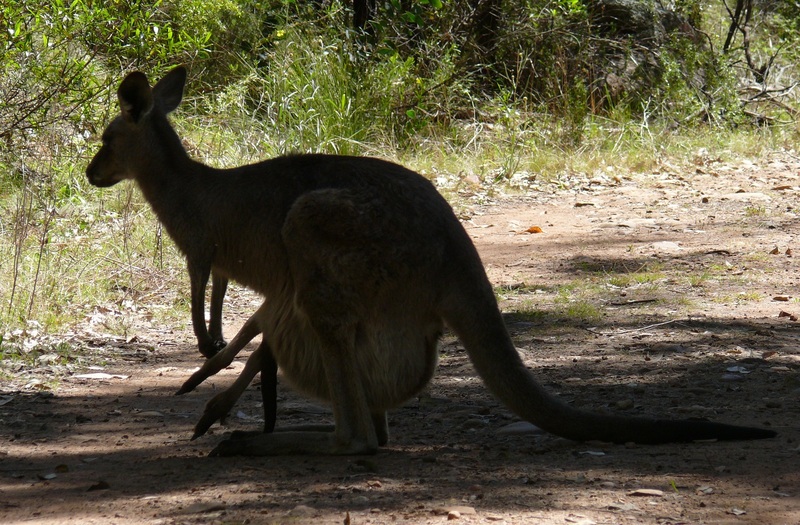 I met this mother Kangaroo with Joey on the path from Split Rock. From White Gum Lookout I was able to identify the grouped trio of landmarks with Crater Bluff on the left, Belougrey Spire in the middle and The Breadknife on the right. 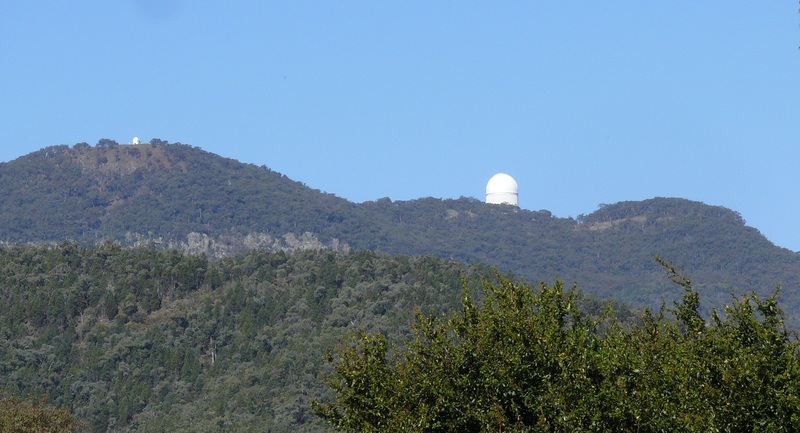 Next on the list was the Siding Springs Telescope something I have wanted to see for a number of years. Siding Springs telescope seen from the campsite at the Warrumbungle NP. Although I was able to see the telescope, access was not available except by postcards in the gift shop. Biggest telescope in the Southern Hemisphere. Siding Springs. 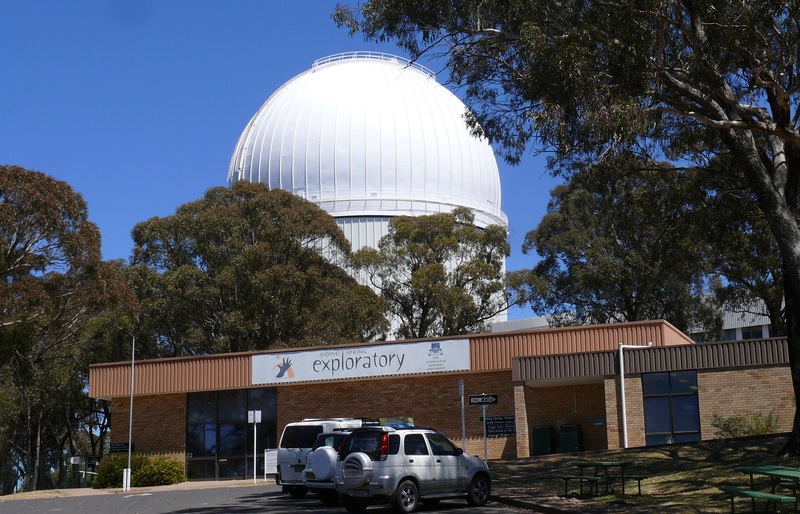 A unique giant solar system model commences at the observatory which is the SUN. 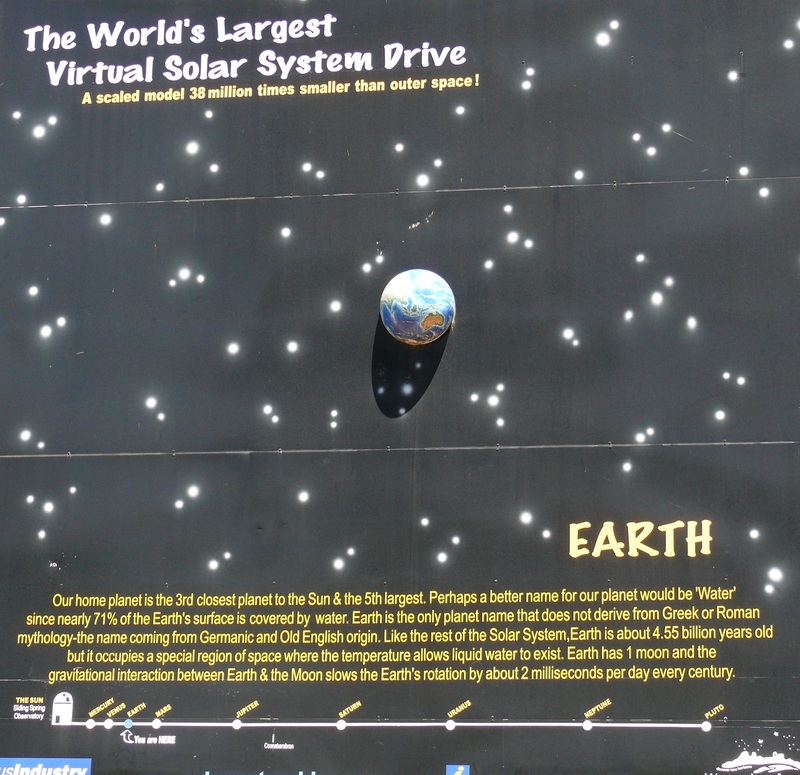 At locations throughout the nearby towns are models showing the distance from the sun. For example Mercury, Venus and Earth are on the same mountain. 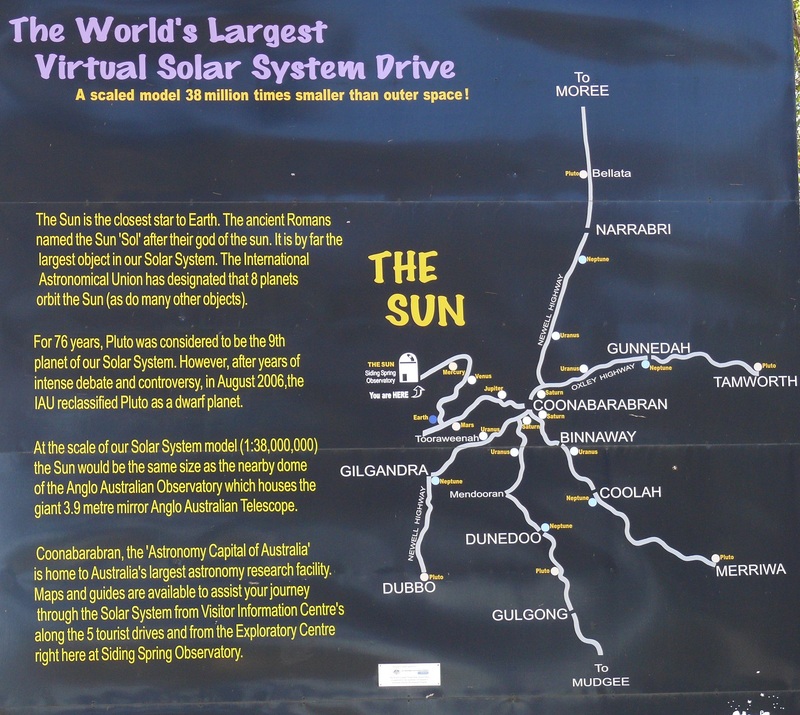 The planet Pluto is at Dubbo 90 klms away. The first sign showing plantes stretching out from the sun. The telescope is the SUN. 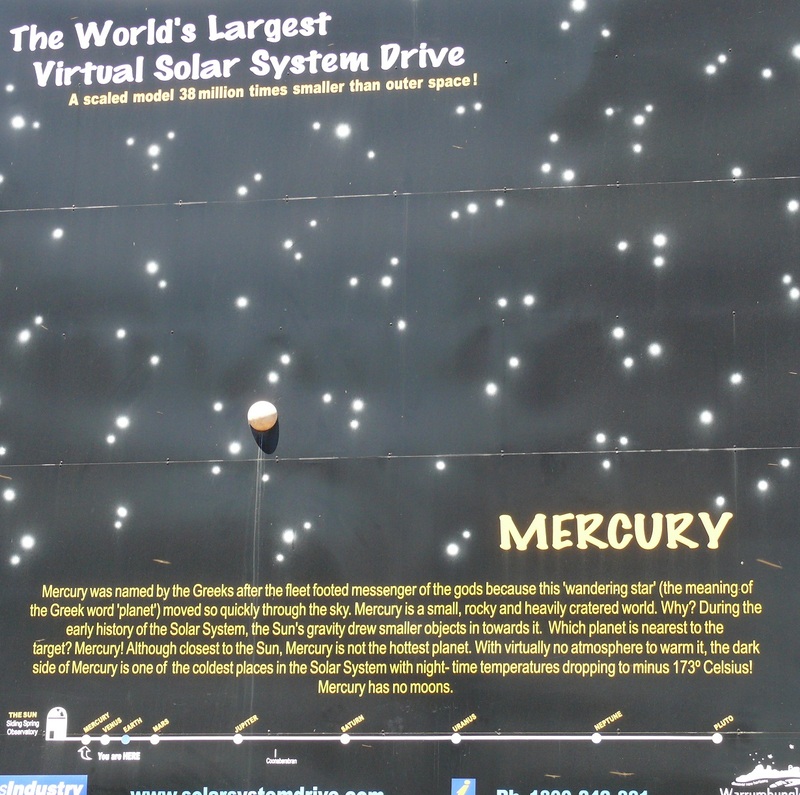 MERCURY is located in the observatory car park. 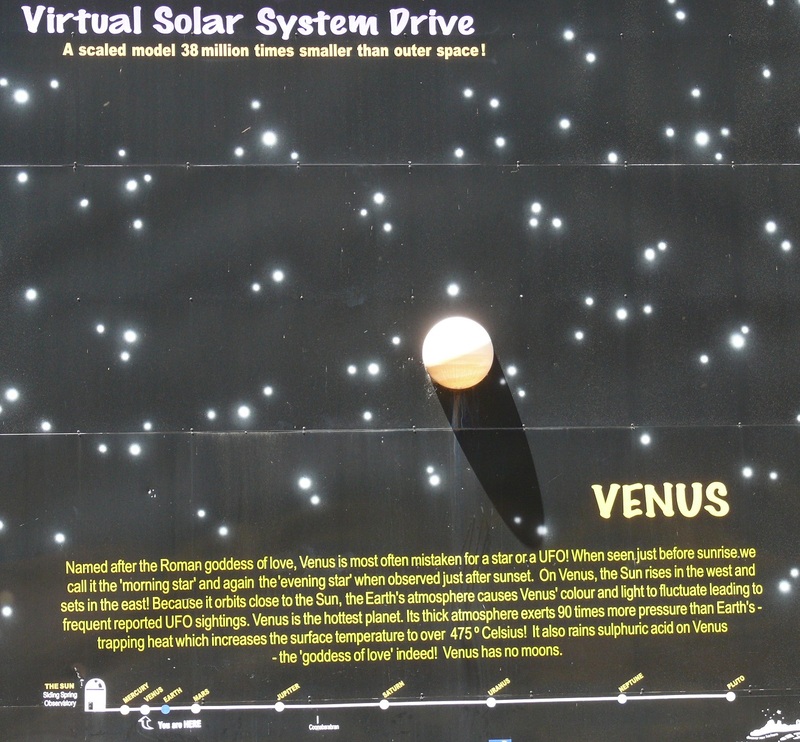 VENUS is located a few hundred metres outside the carpark. EARTH located half way along the winding road to the observatory. 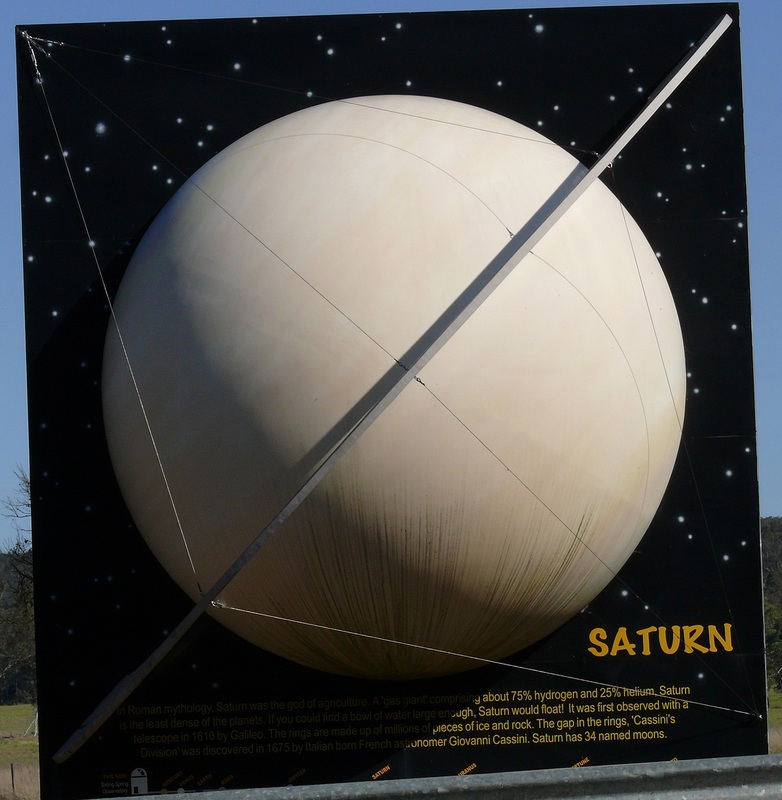 SATURN located a few klms north of Coonabarabran. 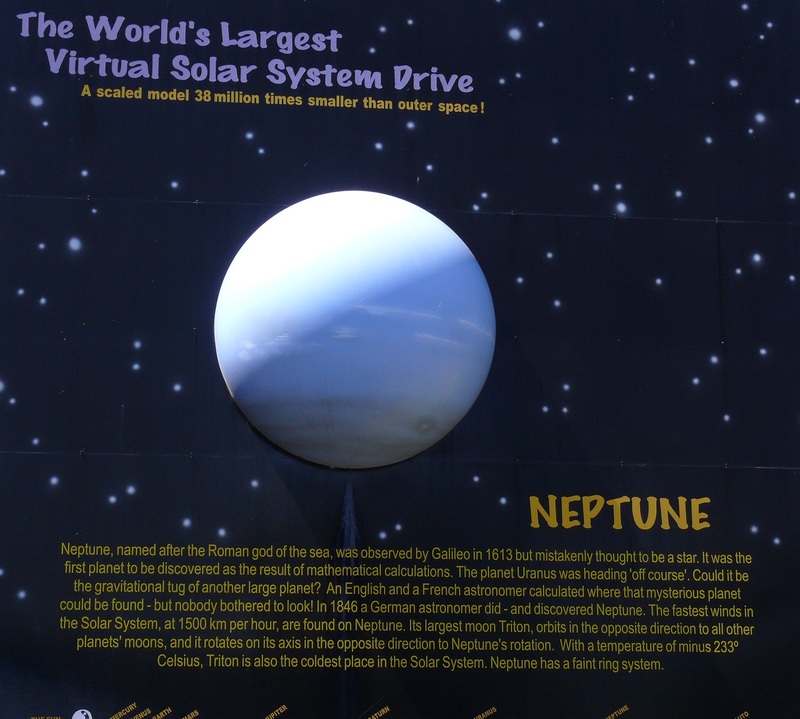 NEPTUNE is located way out at Gilgandra, 90 klms from the SUN. I drove to Coonabarabran this morning to collect my mail. It has not arrived so I need to stay, at least until the mail arrives, perhaps Monday. I visited my aunt Maude and discovered my cousin Bob and wife Dianne were there as well. They had been travelling Queensland and broke their journey to attend a funeral in Cobar then return home for a few days before returning to Queensland to collect their caravan. Bob arranged for me to put WWWGO on his property and camp there while waiting for the mail. Tonight we joined the house-sitters, Adrian & Maz for drinks on the verandah. I received an email this morning and I want to share it with you. I also want to thank Linda C for sending it to me. Let me set some background. In Australia we have many animals which are killed on our roads…Kangaroos, Emu, Wombats, Fox, Camel, Wild Pig, Horses, Cattle, Sheep and well almost any type of animal which is capable of wandering onto a road. Many of these animals cross a road where they want to cross a road. Sometimes they frequently cross in areas on a regular basis. So regular in fact that local traffic authorities place warning signs so motorists are aware to be prepared to take evasive action. The link below will take you to a YouTube presentation from the USA but the information can apply in any country. Without explaining any further I suggest you open the following link in a new tab and then, like me, shake your head and wonder that these people walk among us and even more frightening, they breed. 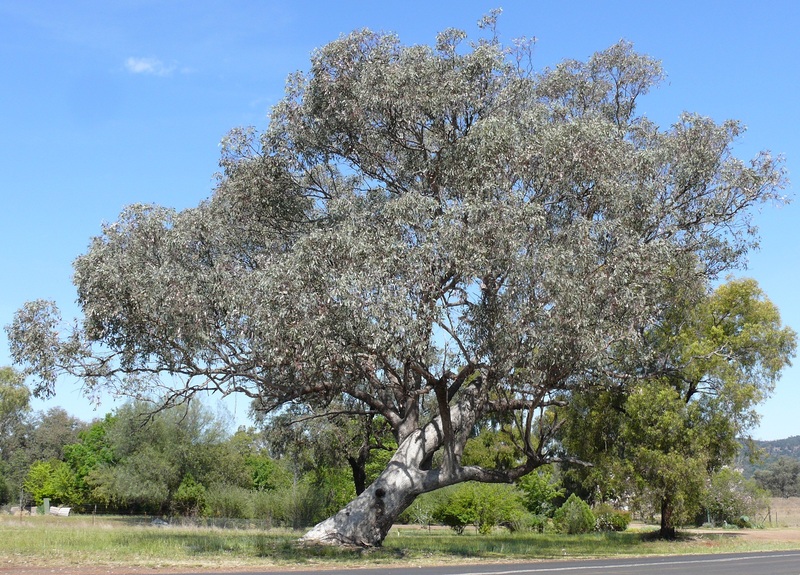 and then drive back to Coona via a back road from Baradine to the Gulargembone Road and then to Bugaldie and on to Coona. 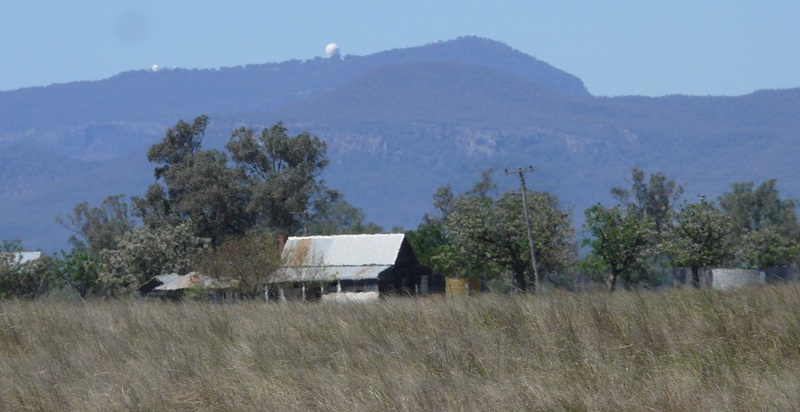 Siding Springs Telescope seen from the other side of The Warrumbungles near Baradine. One of many farmhouse ruins seen along the road to Baradine. A sign told me the track was a 1.7klm loop and would take an hour. An hour? 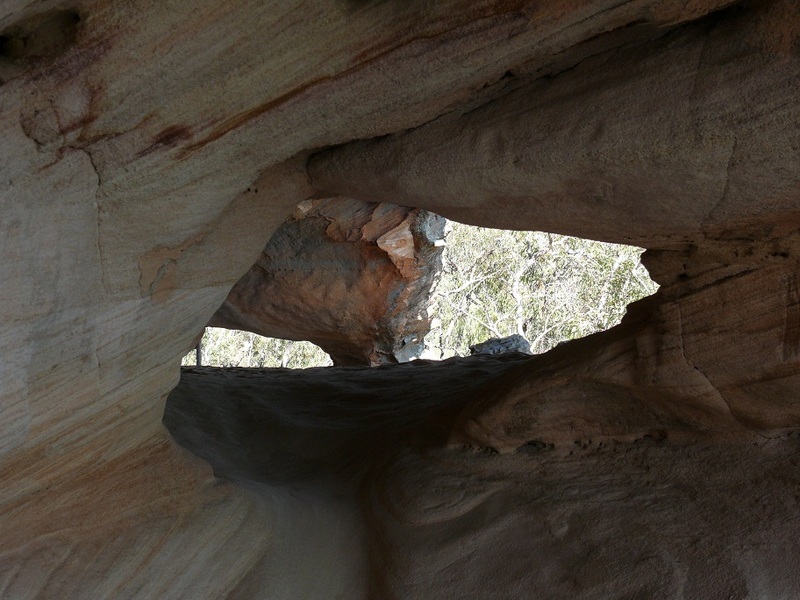 Once I found the caves and wandered around absolutely stunned it took longer than an hour. These caves are huge and I tried to image what it may have been like 1,000 years ago, sheltering perhaps hundreds of people. 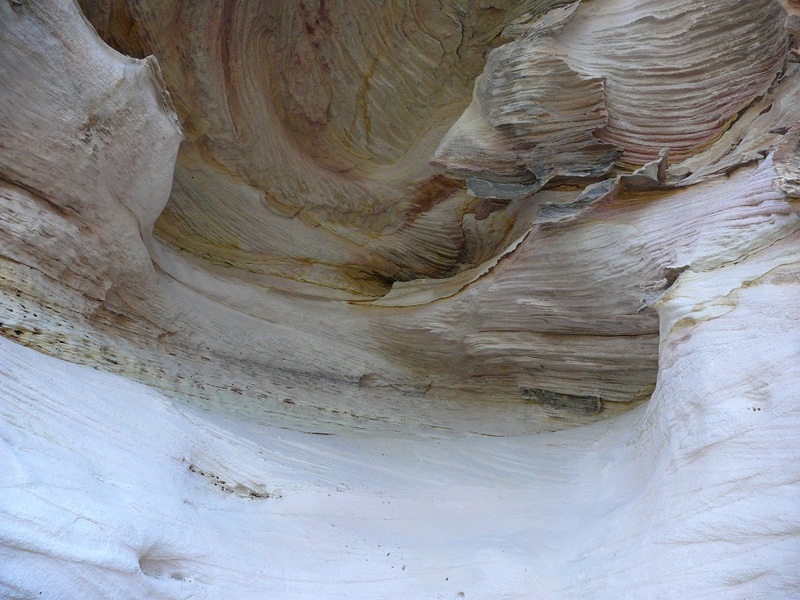 Wall of sandstone at the beginning the caves. There are some sacred cave paintings and some sites where sharpening and shaping of stone axes, spears and axes was carried out. 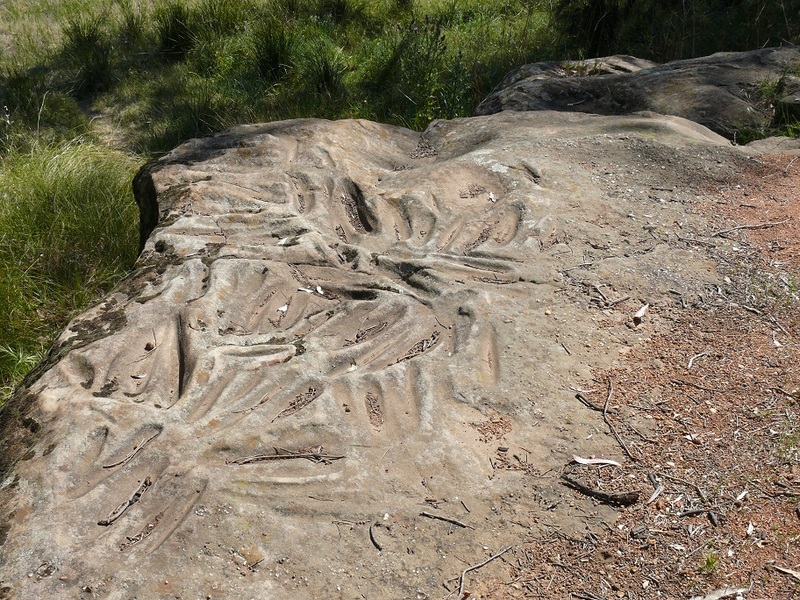 Sharpening and shaping grooves in sandstone. It felt awesome to be able to see this site, for free and without guides and other cultural restraints. That explains why there are no other signs along the highway or in Narrabri or Coonabarabran advertising the site. There is one simple low to the ground sign, Yaminbah Trail and unless you knew what was at the end of the trail most people would just drive past. 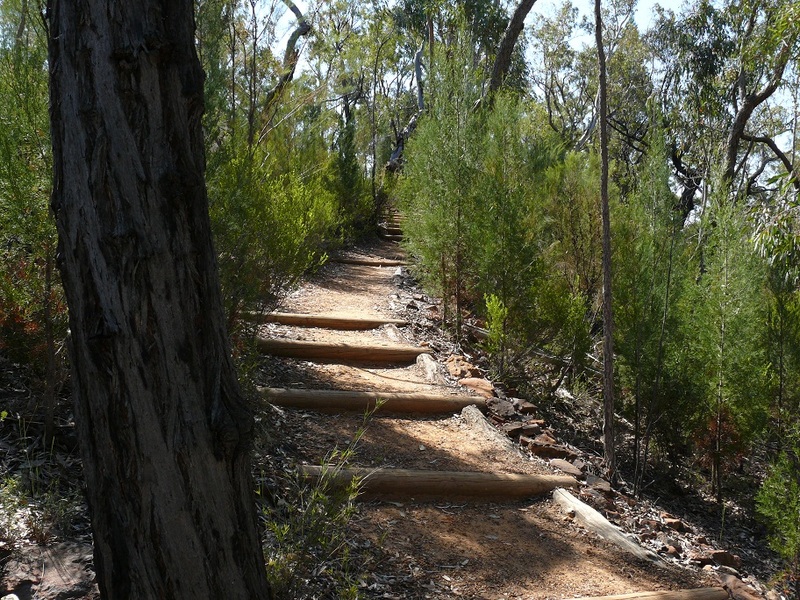 I must thank the Kate at Pillaga Forest Discovery Centre at Baradine for the information and rough maps to find the site. I might mention that it was a very hot day with temps around 34° and I started my walk after 3pm. I took a 2litre bladder of water to ensure I did not dehydrate. I also wore a hat which quite simply was a must. 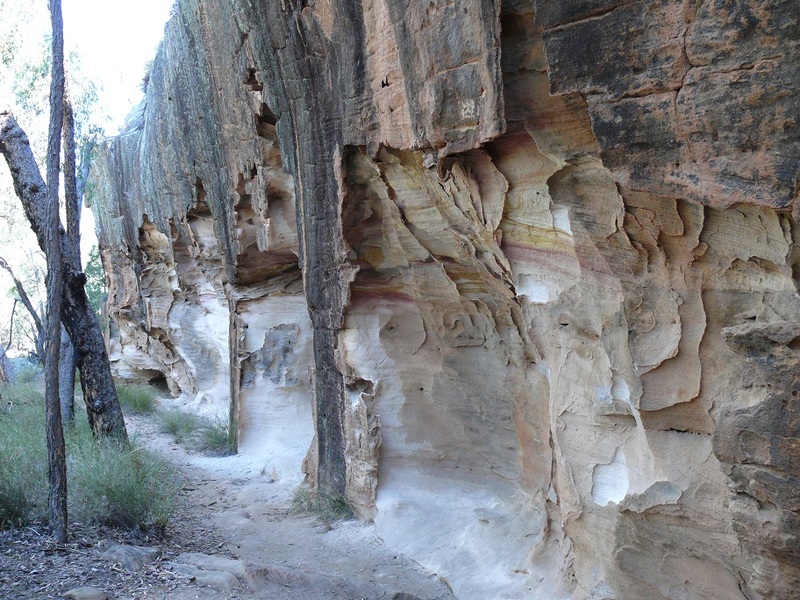 Members of the local Gamilaraay Aboriginal community have done a great job of preparing walking trails and interpretive signs along the loop track around the sandstone outcrop. The last day of the week. Clouds rolled in during the night and light rain fell during the day along with a drop in temperature. Today we went to the Coonabarabran Bowling Club to see the annual Yabby Races. Last year the event raised $17,000 in one afternoon with the funds going to a local charity. Yabby races are a bit like cane toad races, or frog races or cockroach races. First there is an auction of the creatures, they are put in a central starting grid and when the grid is raised the first creature to hop, crawl, slither, or scuttle off the edge of the circular table is the winner. Of course there is side betting and raffles and lots of drinking. The auction and subsequent racing is noisy but by the third race silly amounts are bid for the yabbies. $300 for a yabby to race in a game of chance was pretty much the norm. One particular race the first place prize money was $1,100, second was $300 and $150 for third. The charity got around $300 for that one race. There were 8 races on the afternoon with auction bidding increasing with each race. People came from nearby towns including a coach load from Tamworth. All in all it was a noisy fun afternoon and a local charity benefited from it all.